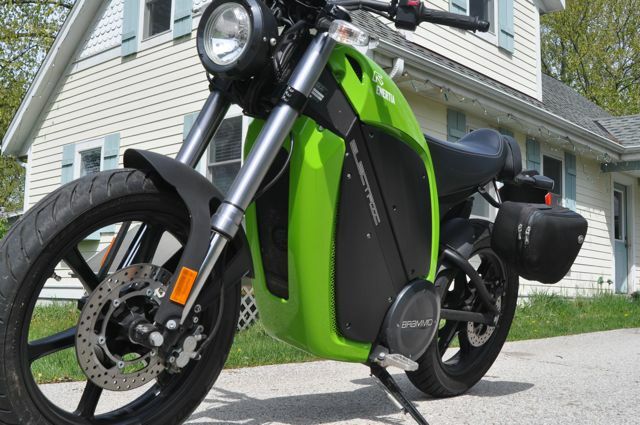 This weekend, I had a blast borrowing a Brammo Enertia electric motorcycle. I came upon it in sort of a round-about way. Turns out that I live not to far from somebody who had been doing some consulting work with Brammo, and had an Enertia on loan from them because of it. I asked pretty pretty please if I could borrow to test-drive, review, and show off at Earth Day events. Never hurts to ask, and I was granted permission to take it out for a few days. Now before we get too crazy here, a few disclaimers. First of all, I’m not a super-experienced cyclist, I’ve only been riding a few years, and most of that has been on my OWN homebuilt electric motorcycle. I can really only compare this bike to a handful of others that I’ve ridden. I think that’s OK though as I believe this is a great starter bike and it’s marketed to both experienced and first-time riders. The cycle looks pretty cool. It’s sort of a retro-futuristic clean look. I liked the color. It’s somewhat compact and upright. Hopping on, the seat height and handlebars all feel like they are about where they should be. The saddle is skinny and firm, but not uncomfortable. The whole bike looks well put together – it has good fit and finish – it does NOT look like a high-end conversion or just a bunch of stock parts all assembled onto a custom frame. Overall, it feels sleek and simple. I LIKE the instrumentation on the cycle. 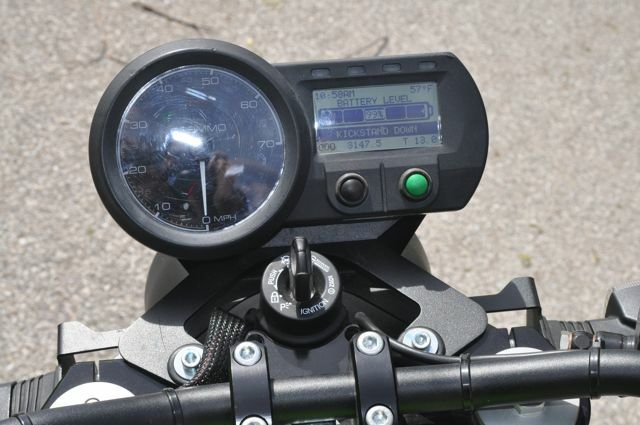 Left of center is a speedometer with a “GO” green light in the middle, and right of center is a multipurpose display. That display has the odometer, trip odometer, battery meter, power meter, and some other information, including ambient temperature and motor temperature. It was nice having that info if I wanted it, but I also liked that the speedometer was a fairly plain and normal analog needle speedometer. I’ve always surprised at EV projects where the designer somehow thinks that a jumpy digital display is better than a nice analog one. On my one night ride, I noted that the lighting on the speedometer was clean and very readable. The multi-display is backlit LCD and was the right brightness for easy night-time reading. The multi-display also gave some other nice information, in plain English. For example, if the cycle was on, but the kick-stand was down, it told you. Likewise, if you hadn’t turned the headlight on, it let you know that as well. Since the cycle doesn’t have a gas engine that idles, there’s no sound cue to let you know that it’s on. Instead, when you power up the cycle, a sound effect plays (boy would it be fun to customize THAT!) and the lights come on. Then you are ready to ride, four little green LEDs chase across the top of the multi-display, just to let you know that you are on and ready to go. When you are actually riding, they are off, I could imagine them getting annoying during a ride if they did stay on! 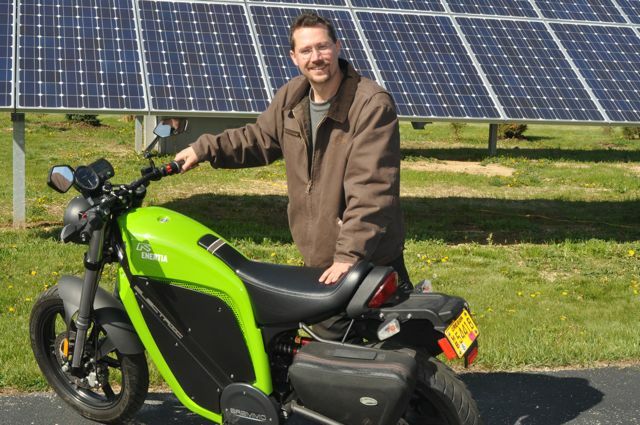 On my electric motorcycle, I built a green light into the gas-tank as a “ready to go” indicator. On both cycles, the lights serve as an indicator to the rider that the vehicle is ready to go at a touch of the throttle. The Enertia is fun to ride. It’s zippy and has good enough acceleration to give you a nice sense of speed, push you back in the seat just a little. Speaking of seat, this is a one-seater, no back seat or passenger pegs on this one. 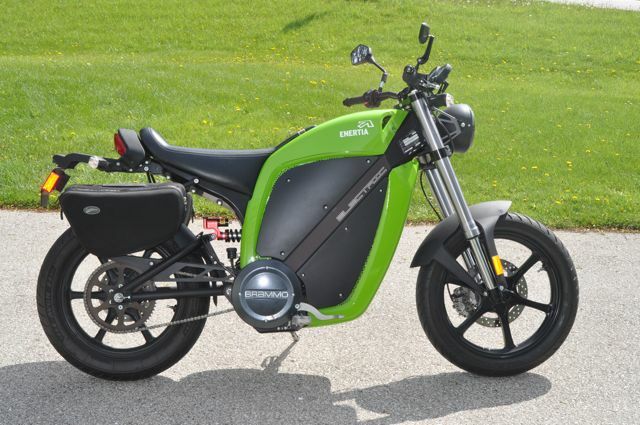 Although I don’t do it often, it’s kinda fun to give non-riders a lift on my electric Kawasaki, although I really can feel the motor working harder, so it’s easy to see why Brammo just designed the Enertia for one. To me, the suspension was just a little stiff. The Enertia does feature adjustable rear suspension. This wasn’t my bike, and it was just briefly on loan, so I didn’t touch it. I’m sure that if I owned the cycle, I would be able to adjust the rear suspension a little more to my liking. The shape of the cycle is pretty nice. I could squeeze my knees into the side of it well enough that I felt like I would be able to steer that way. The Enertia does NOT have a wind-shield. Now, I am a pretty wussy rider anyways, but at high speeds, lack of windshield isn’t real comfortable. The top speed on the bike is “60+MPH” and when I twisted the throttle full-out, it did 63 in a flat, straight stretch of road. I went out on a section of 55 mph freeway. The cycle did fine there, but I felt like I was just wasting battery power. That, and I DON’T LIKE the highway. It’s straight and boring, and there’s too many crazy SUV drivers there going illegally fast. I like motorcycles on curving side-roads and rolling hills, where speeds and conditions vary. I think the Enertia is well-suited for those situations. It does have enough oooomf for short hops on the freeway, but I wouldn’t recommend it for any long distance on a highway, considering the typical speeds in our area. Throttle response was nice. It was actually one of those things that was well-done enough that I simply didn’t think of it at all until later, when trying to come up with comparisons between my homebuilt and the Enertia. The cycle responds quickly to the throttle, but not so much so that you feel like you are going to do a pop-a-wheelie, or feel a jerk of the motor any time you hit a bump or a pot-hole. Both were concerns the first time I rode my bike, until I tweaked the throttle response. Brammo got the throttle right – nice and simple, and a good feel. Brakes on the cycle are disc, front and rear, and work very well. 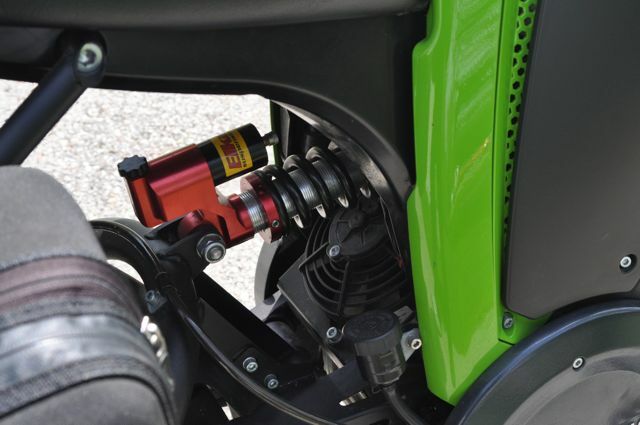 The rear brake is right foot pedal, as is typical on common gas motorcycles with a clutch. A while back, I rode a friend’s electric motorcycle where he converted the rear brake to run from the left handle-bar, similar to the brakes on scooters. I liked how the setup completely freed the rider from any foot controls. Without a clutch on the left, Brammo could also have gone with a rear hand-brake if they chose. Charging was just a little different than I thought it would be. 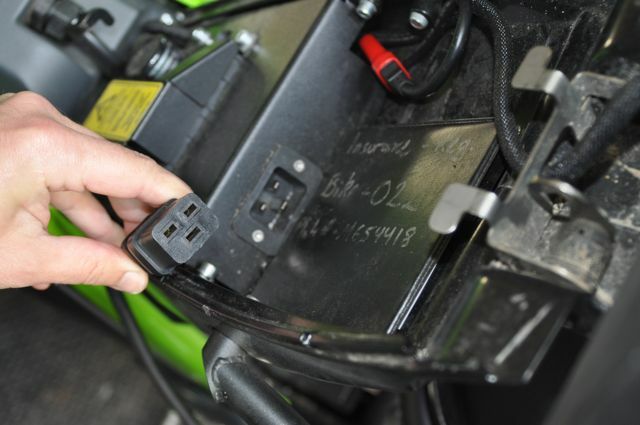 Most EVs that I have been in just have some sort of simple plug you run a common extension cord to. You plug it in, and a second or two later, the vehicle starts charging, usually with a light or fan noise as an indicator that it’s working. On the Enertia, it is a little more complicated than that. To start with, the ignition key has to be in a certain specific position. One more click to the left of locking the steering column is the “Charge” key position. Once you put the key there, you press the tank power button, and the cycle powers up, pretty much the same way you would when ready to ride, only it’s now in a charge mode. The multi-display lets you know that as well. Then, you take out the key, and unlock the seat. The charging port is UNDER the seat, and the easiest thing to do is just take the entire seat completely off. Then, you plug in the power cable and it starts charging. One thing I LIKED about the charging set-up is that the multi-display tells you it’s charging, but it also gives you a “% Full” and estimated time remaining until full charge. While at an Earth Day event and charging, I knew exactly how long I needed to top off the tank. Charging from a 17KW photo-voltaic array felt pretty good too. The one thing I didn’t realize at the time is that while in the charge mode, the lighting system is active. I had the headlight on for about two hours before I noticed and turned it off! The charging system is very well integrated with the cycle. 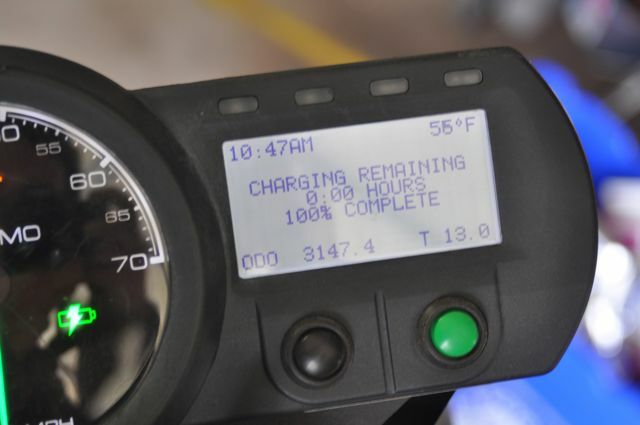 A while back, I did get a chance to ride another brand of cycle, and I noticed the charger on it was a stock one commonly mail-ordered for home EV conversions. Pretty much everything on the Brammo has a nice integrated feel to it. Hmm. How do I compare this cycle to others? It goes faster and farther than my Electric Kawasaki, but I do like my seat and suspension better than that of the Brammo. I also like that my motorcycle is “beefier” in the best possible way in feel compared to the Brammo Enertia. I did notice in riding that the Enertia felt like it moved around under me a bit more than my bike does. A while back, I got to ride a Zero street model. It was quieter than either the Enertia or my cycle, because it was belt-driven (which I thought was really cool!) but I didn’t like the seat and the seat height on the Zero. That may have been tweakable through suspension, but I’m a 6-foot tall guy, and to have the edges of the seat digging into inside upper thigh while straddling that bike wasn’t comfortable. The overall style of saddle on the Zero Street and Brammo Enertia are almost identical, and yet the Brammo seemed much more comfortable. The only one really odd little item that bothered me was the kickstand. It’s just a little straight metal stick. I couldn’t see it from riding position, and my foot didn’t naturally go right to where it was. I thought maybe it was just me, but a friend took the cycle for a ride around a parking lot and I noticed he had to dig around to find the kick-stand too. I’m sure that after a few rides, I’d be used to it, and would find the kickstand just fine, but for now, it seemed like it kinda tucked away a little too far. This Enertia came with soft case saddlebags. I really liked the saddlebags that were on this bike. They were soft-cases, with zippered opening, and another zipper that would expand the case. They were large enough to be really useful carrying some cold-weather gear and my full-size DSLR camera, already inside it’s own soft case. 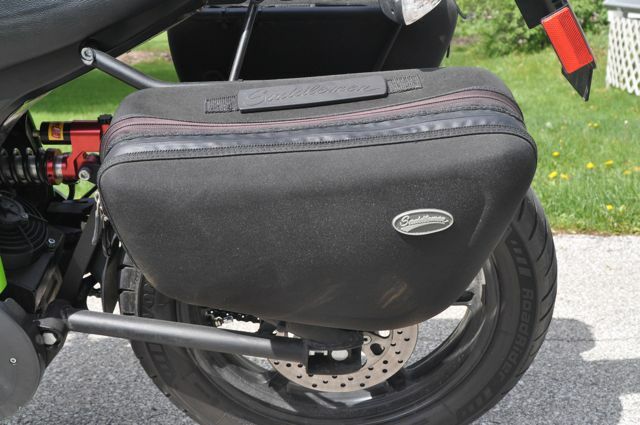 The saddle bags didn’t get in the way at all the way hard-cases sometimes do. I might have to stitch up some soft-cases for my Kawasaki. On the other hand, I did NOT attempt to pick up a family-size pizza on the Enertia – something I commonly do on the Kawasaki. Gosh darn it. Maybe next time I can borrow a Brammo, I’ll see how it does on the “pizza run”. That’s right, no gas, no oil, no anchovies! Brammo is also coming out soon with the Empulse, which promises to be a high-performance electric sport-bike. Overall, I REALLY LIKED IT. Clean design, easy to ride, zippy, and fun. If I didn’t already have my homebuilt electric motorcycle, I sure would consider the Brammo Enertia. What do you think? Have you test-driven one? Do you own one? What questions do you have for me? Please post your comments below! PS: Many more photos of this cycle posted at this gallery. If you would like to know more about my homebuilt electric motorcycle, or how YOU can build your own, please click here. For a review of the Brammo Empulse, please click here. Earth Week and Beyond! Movies, Motorcycles, and Chickens! I love mine and have now 3450 miles on it. Great machine but its sooo fun to ride that I’ve taken a lot longer to finish both my Rabbit EV and my Open Revolt controller which still needs the high voltage section built and tested, yiikes. Still happy I bought it and it gets lots of positive comments wherever I go with it. looking to buy enertica any leads?